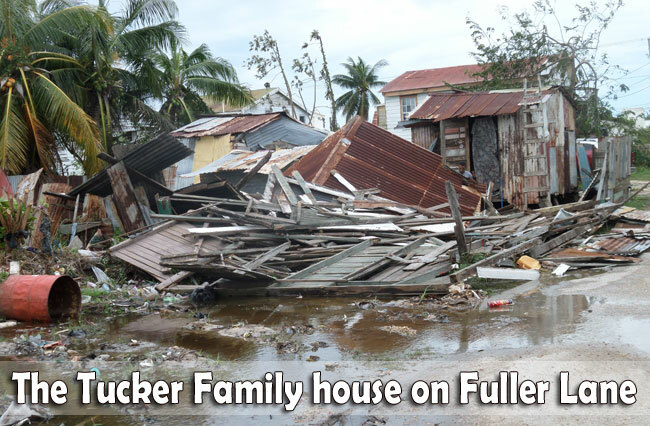 CENTRAL BELIZE, Fri. Aug. 5, 2016–Residents of the hurricane-struck zone of Central Belize, and primarily those living in the Belize District area—the offshore cayes, Belize City, Ladyville and the Belize River Valley—are still trying to put their lives back together after Earl ripped through the country on Wednesday night and early Thursday morning. 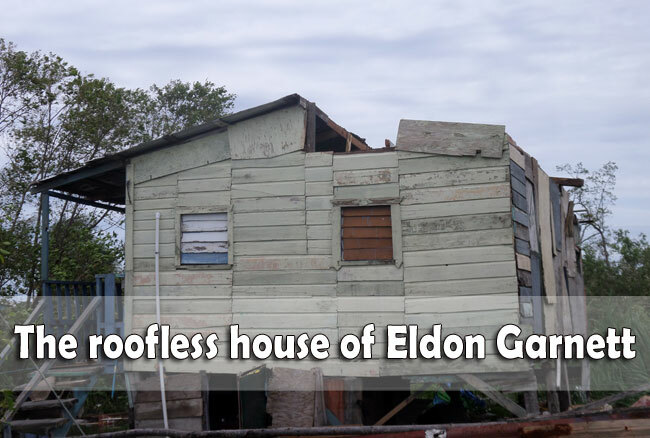 An official tally of Earl’s toll on Belize is still pending; thankfully, no deaths have been attributed to the hurricane in Belize, although 6 deaths resulted from a storm-related incident on Sunday in the Dominican Republic. 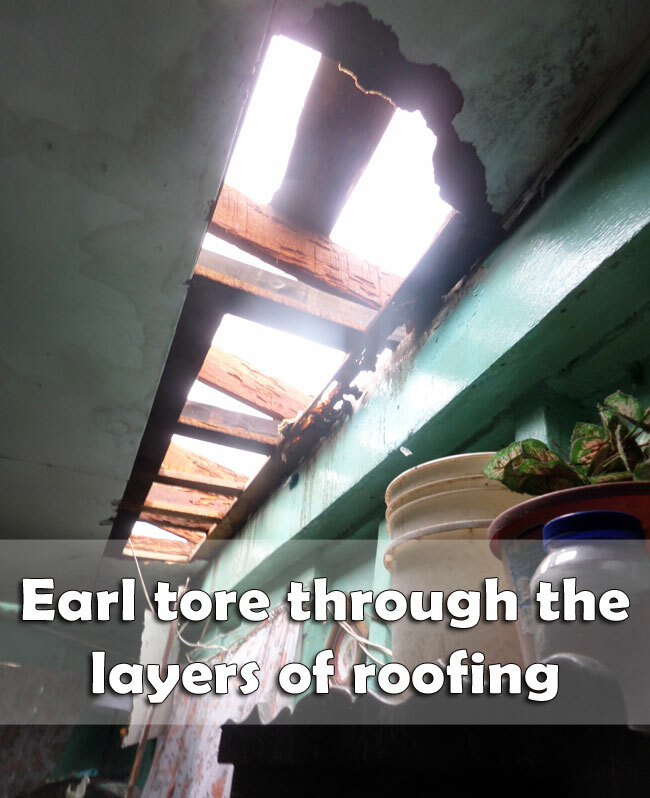 In Belize, hundreds of distress calls were made as Hurricane Earl pounded Belize, leaving many homes as well as public buildings roofless—or at least with partial roof damage. The trail of destruction led as far as Belize’s westernmost town of Benque Viejo del Carmen. Earl uprooted large trees; downed large billboards and signs, as well as public bus stops; compromised light poles and pulled apart high tension cables, leaving thousands without power even a day after the all-clear had been declared. According to the National Hurricane Center in Miami, the center of Earl made landfall just southwest of Belize City, Belize near midnight. The last reports from an Air Force Reserve Hurricane Hunter aircraft recoded flight-level wind of 85 knots or 97.8 miles per hour. It estimated landfall intensity at 70 knots or 80 miles per hour, although many Belizeans believe that the storm at times packed much stronger winds. Earl intensified to hurricane strength shortly before making landfall in Belize. Official reports indicate that hurricane-force winds extended outward up to 15 miles from the center of the storm—a span of roughly 30 miles—and tropical-storm-force winds spanned 140 miles (220 km). 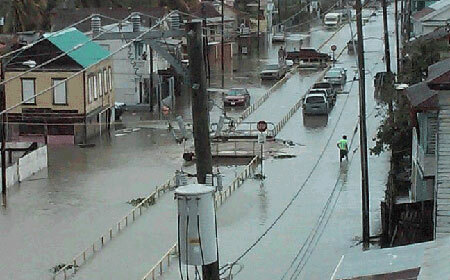 Particularly along the coastlines of Belize City and nearby rural communities, such as Ladyville, Earl brought with it a storm surge of up to 6 feet, causing water damage to many homes, and vehicles which were parked in the path of the surge. 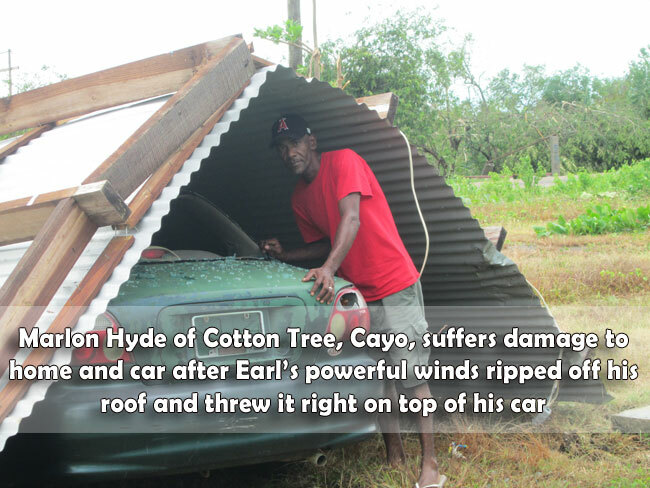 However, its massive winds also caused structural damage inland, as far as Cayo. In one of the less likely places to feel the destructive effects of the storm, Marlon Hyde, 41, a trucker of Cotton Tree Village, located two miles out of Belmopan’s city limits, lost his home and car. Hyde told us that he was inside his house when the wind began lifting his roof. He nailed it back three times, and realized that it had not been built securely enough to weather the storm. That’s when he decided to flee with his wife and child to his mom’s home just next door. 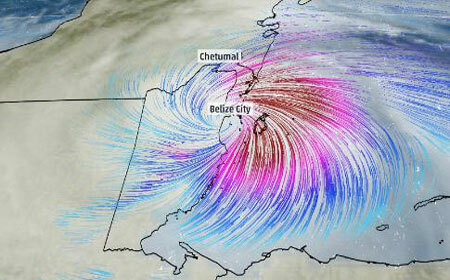 At around 1:00 a.m., he heard the wind roar and then subside. When the wind picked up again, it ripped off his roof, which flipped and landed right on top of his car. Hyde, who also consequently suffered water damage to all his household contents, estimates his total loss at $10,000. Ovidio Moralez, his wife, children and grandchildren, were inside their home in the same village when the storm caused their kitchen to collapse, destroyed a portion of their roof and brought about a foot of water into their wooden home, where they felt the brunt of the storm’s impact somewhere between 11:00 p.m. on Wednesday and 5:00 on Thursday morning. Meanwhile, two men were stranded on the highway, where they weathered the hurricane. 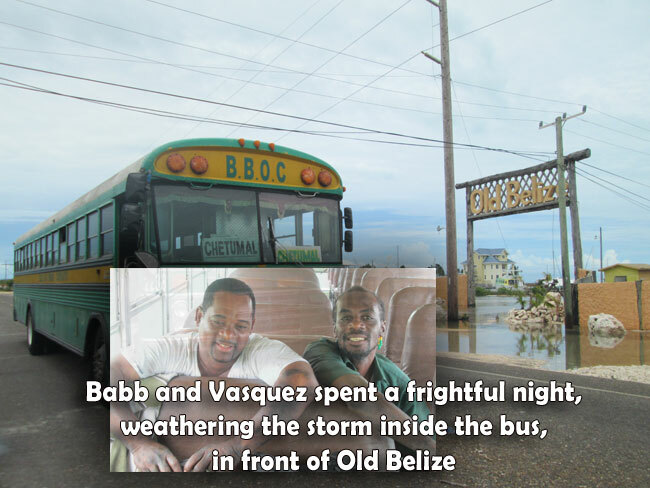 Javier Vasquez and Leroy Babb spent a sleepless and terrifying night in a bus in front of Old Belize, located around Mile 5 on the George Price Highway. Vasquez, who owns 5 buses, told Amandala that he came in from Chetumal earlier in the day but had to rescue another of his buses which had broken at Old Belize. After they were able to start that bus, he took some of his workers home and was traveling through the Philip Goldson Highway when he had to turn back, due to flooding. He decided to use the George Price Highway instead, and that was when his bus shut down while driving through the flood waters. Babb and Vasquez were terrified as they weathered the storm in the bus. Thankfully, the water only came as high as the second step of the bus. On Thursday, the day after the storm, they were still trying to get the bus repaired in order to remove it from the area. We will feature other reports of the storm’s impact, especially in the hardest hit areas of Belize City and the Vista Del Mar/Ladyville, elsewhere in this paper. The National Emergency Management Organization (NEMO) declared an all-clear at 9:00 a.m. on Thursday, as the storm, which had weakened to tropical storm strength, was moving over Guatemala and headed next for Mexico. “NEMO with much concern acknowledges serious sufferings endured by thousands of Belizeans and the devastation of homes, businesses, government and private buildings,” its final Thursday morning advisory said. The Philip Goldson International Airport (PGIA), which was closed Wednesday, resumed operations Thursday. 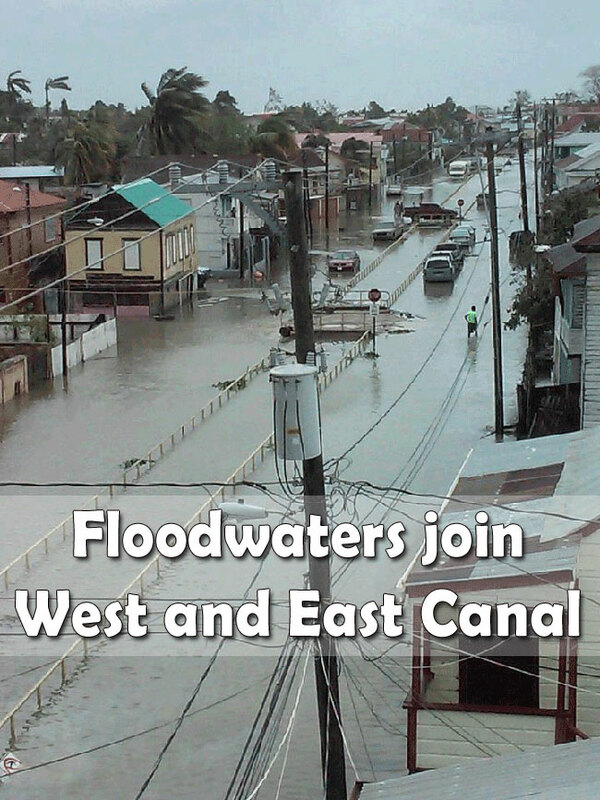 Concerns remain over possible flooding in Cayo.